What feast did Jesus attend when he was 12? 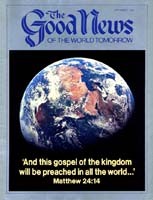 God's Church pioneers in living and teaching the unique way that will soon bring peace to the world. That system of education, which extends to every facet of life, is humanity's only hope! The world that you live in is breaking down - what is happening in it no longer makes any sense! Wherever you look there seems to be progress - wonderful inventions and technical marvels. Knowledge in nearly every field is increasing. It seems that, if he puts his mind to it, there isn't anything man can't do. Until you look at the other side of the coin!